If you have any questions about the NARA information page below please contact us. The important superyacht NARA is a motor yacht. 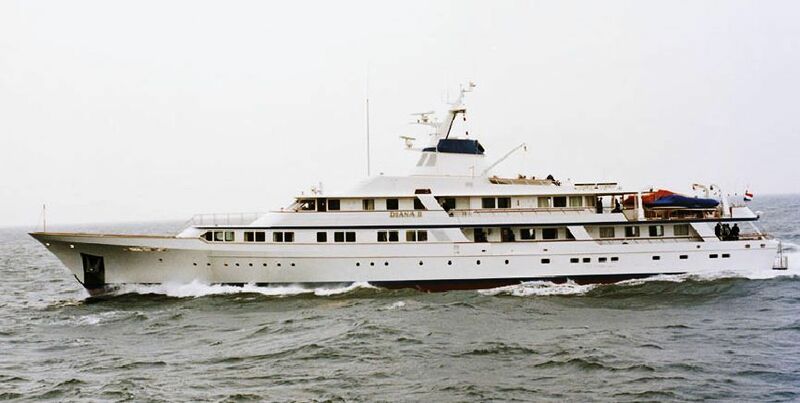 This 61 m (199 foot) luxury yacht was crafted at The Feadship Royal Van Lent Shipyard in 1979. NARA used to be named 735; Diana Ii; Dianamare. Superyacht NARA is a striking yacht that is able to accommodate a total of 26 people on board and has around 17 professional crew. The graceful boat has been designed by a naval architect called De Voogt Naval Architects. Pierre Tanter produced the interior design. NARA’s owner is from the Middle East. The photo shown is of the yacht when first launched as DIANA II and she has since been refitted. The yacht's wider design collaboration came from De Voogt Naval Architects. The formal naval architecture plans are a products of De Voogt Naval Architects. Motor Yacht NARA received her stylish interior designing from the interior design firm of Pierre Tanter. In 1979 she was formally launched with celebration in Kaag and following sea trials and finishing touches was thereafter handed over to the yacht owner. The Feadship Royal Van Lent Shipyard completed their new build motor yacht in the Netherlands. The main hull was constructed with steel. The motor yacht superstructure is made mostly from aluminium. With a width of 9.69 metres / 31.8 feet NARA has fairly large interior. A fairly deep draught of 3.2m (10.5ft) limits the number of overall harbours she can enter, depending on their specific characteristics. She is driven by twin large MTU main engine(s) and can touch a comparatively good speed of around 20 knots. The engine of the NARA gives 3155 horse power (or 2322 kilowatts). Her total HP is 6310 HP and her total Kilowatts are 4643. Her propulsion units are twin screw propellers. For stabalisers she was supplied with Vosper. The substantial luxury yacht motor yacht NARA is able to accommodate up to 26 people and 17 professional crew. 60.56 metres / 198.7 feet. The propulsion comes from two 3155 HP or 2322 kW MTU. The Model type is 16V 956 TB71 diesel. Giving the combined power of 6310 HP /4643 KW. The luxury yacht NARA displayed on this page is merely informational and she is not necessarily available for yacht charter or for sale, nor is she represented or marketed in anyway by CharterWorld. This web page and the superyacht information contained herein is not contractual. All yacht specifications and informations are displayed in good faith but CharterWorld does not warrant or assume any legal liability or responsibility for the current accuracy, completeness, validity, or usefulness of any superyacht information and/or images displayed. All boat information is subject to change without prior notice and may not be current.